Many people limit eating out when travelling by packing their own snacks and simple meals. Pack foods in a small cooler with ice. Remember to bring eating and serving utensils, paper plates, napkins, hand sanitizer and hand wipes. A can opener and small kitchen knife can be useful too. Try this simple sandwich filling to make your on-the-road meal tasty and healthy. 1. Toss together chicken, celery, green pepper and onion. 2. Add sliced grapes and mayonnaise. 4. 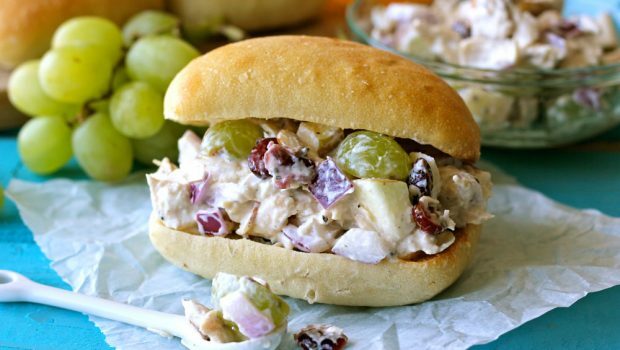 Spread chicken ‘n’ grape blend on bread, roll, tortilla or pita. 5. Add crisp lettuce or other greens. 6. Serve with fresh or canned fruit.